Normally you can’t get a free credit score with no credit card, but I just did. I didn’t even have to sign up for any “free trials” or anything else. There is a relatively new service from CreditSesame.com that gives you your free credit score – and much more – instantly. It’s free, you don’t have to provide a credit card and there are no trial periods. Pretty cool. I took them for a test run and was impressed. I thought I’d share my thoughts with you. 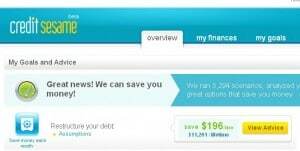 Credit Sesame is a site founded by former bankers that helps people manage their credit and save money on their loans. They ask you six or seven questions to get a picture of who you are financially. Once you answer the questions, they give you your free credit score. Your score is based on the VantageScore ® 3.0 and it is provided by TransUnion. It is not the same as your FICO score. The thing to keep in mind is that different lenders look at different credit scores. The VantageScore isn’t as ubiquitous as FICO but it will give you a clear picture of what’s happening in your credit file. Based on the information you provide, they try to come up with ideas to reduce your interest cost for any and all debts and mortgages you have. They are very big on restructuring your debt – paying off high cost loans with low cost alternatives you may not be aware of. They do this by scanning across a universe of over 3,200 financial institutions. If you take them up on any of the offers, they make money. If you do use them, the loan doesn’t cost you any more than if you would go directly to the lending institution yourself. So far…so good. Credit Sesame has a very strong incentive to be very useful to you and save you money. What’s not to like? And regardless of what you do, you end up with some very valuable information – including a free credit score. It took less than three minutes for me to go through the signup process. It was painless. After I was done, I immediately got my free credit score. Nicey nice. One sticky point is that CreditSesame does need your Social Security number to access your credit information. This makes sense of course. I can’t imagine how any company could provide your credit score without either a credit card number or your Social Security number. Since I do all my banking online anyway and I’ve never had a problem, I wasn’t too concerned about it. Encryption technology is pretty amazing. If you are comfortable using your credit card online, you should probably feel OK about using this service too. Your information is always safe and secure. We use secure data transfer, firewalls and 128-bit SSL encryption with 2048 bit keys. That’s the strongest encryption method available for the internet, used by banks and financial websites. 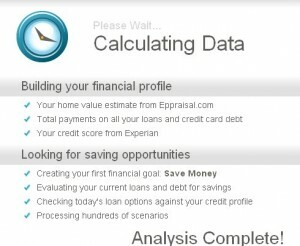 Also, CreditSesame.com pulls data from Experian to get your free credit score. According to Sesame, it’s a soft pull so this doesn’t impact your credit score. As promised, they deliver your free credit score. They also tell you what percentage of your available credit you are actually using. If your percentage is high it’s not a good sign. You want it to be as low as possible if you want to have a better credit score. They also tell you what your home is worth and the interest rate you’re paying on any debts. That’s cool, and since it’s all free, I’m a happy Pilgrim. They go on to recommend ways for you to reduce your interest expense for any debt you carry. Here’s where CreditSesame.com tries to make some shekels. This part may or may not be of value to you. For me, it wasn’t particularly useful because thankfully I have little debt and I pay off my credit card balance each month. But depending on your situation, this could be a useful, free benefit. Rather than you making tons of calls all over the country looking for the cheapest credit card interest rate or home mortgage, this neat little company does the shopping for you. The more I learned about this company, the more I felt like I died and went to credit heaven. CreditSesame.com sends me free e-mail alerts whenever there is a change to my credit profile. That’s pretty cool. Having said that, it’s important to keep in mind that using just one source of credit information isn’t enough to really monitor your credit for fraud or identify theft – but it’s a darn good start. Free credit tracking and updates. I would have to say that this is a pretty cool service. I signed up yesterday and love it. Remember…it’s free. Who’s next? I highly recommend that you sign up for your free credit score and monitoring with CreditSesame.com. Is there anywhere I can get all three credit scores for free; no trial; no credit card;no membership? Sure. As I said in the post, write to each of the bureaus. They’ll send you the report no problem. Have you tried that? My husband does not have an e-mail , he use’s mine,,,mmarqueen@yahoo.com,,,,,,how can we check his credit score?? 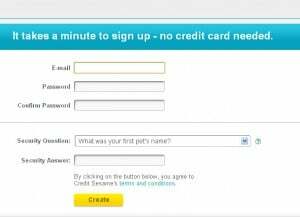 Have you tried Credit Sesame? I don’t believe it would be a problem using your email. and check out go free credit. I wish you better luck sir.